Welcome to Reception. We are so excited for the year ahead with our new friends. We have welcomed new friends from lots of different nurseries as well as children from The Orchards Nursery. During the first weeks of this half term we will be settling the children into the routines and expectations of school. We will be supporting children to make friendships with others and develop good relationships with all adults. Working in Reception this year are Miss Harrison, Mrs Greenacre, Mrs Travers, Mrs Pitchers and Miss Brooks. Most of all we will be showing our children that learning in Reception is lots of fun! 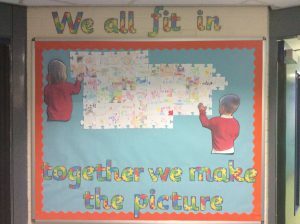 This half term our topic question is ‘Who am I?’ We are looking forward to getting to know the children and what it is that makes them special. In addition we will be finding out about the children’s family, where they live, all about the body and growing up. Through this topic we will be learning numeracy and literacy skills and the children will follow the Read Write Inc programme. If you have any questions or concerns please speak to any of the adults and we will be more than happy to help or support you. This is our first classroom display which shows the children that each and every one of us is unique and special and each of us are needed to make Reception the best it can be. Our PE is on a Thursday afternoon. Please leave your child’s PE kit in school, we will send them home every half term. Please ensure your child brings in their reading book and reading record every day. This half term books will be changed on a Tuesday. It is important that you read with your child a minimum of 3 times a week and write a comment and sign their reading record.